Sergey Dyomin’s dystopian paintings have played around with images of everything from pigs to sewing machines and railway cars, but it’s his treatment of monkeys that got him noticed. The Latvian artist won international acclaim in 2010 with his painting Boris And Gleb. 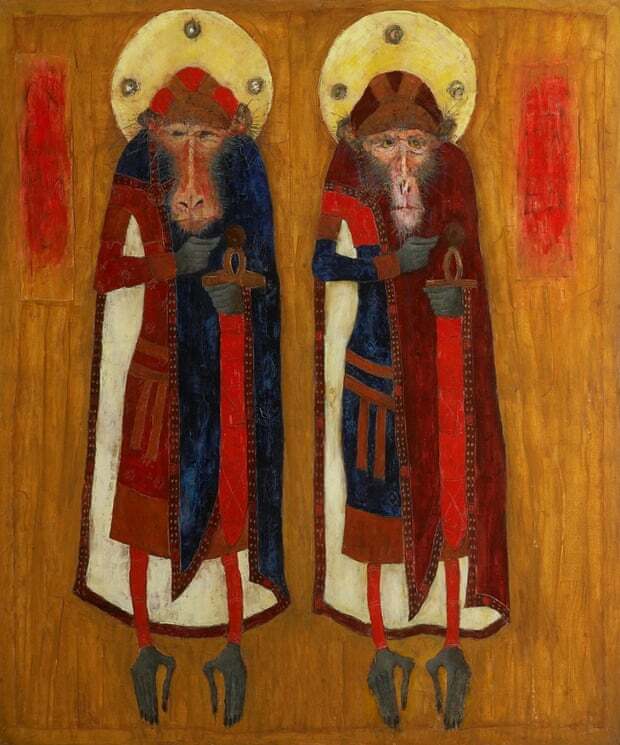 Featuring two monkeys dressed up a 11th-century Orthodox saints, it reached the final in an online competition for international artists hosted by London’s Saatchi Gallery. 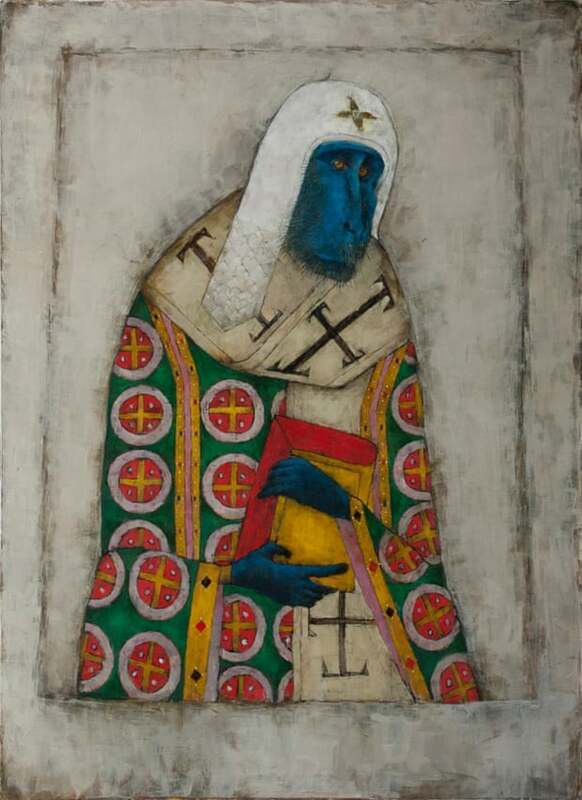 Another simian painting earned him a second-finalist spot in 2014 in the same competition – Blue Monkey, featuring a solemn, blue-faced baboon dressed as an Orthodox cleric. The painting was so popular it was purchased before it hung in the winners’ exhibition. 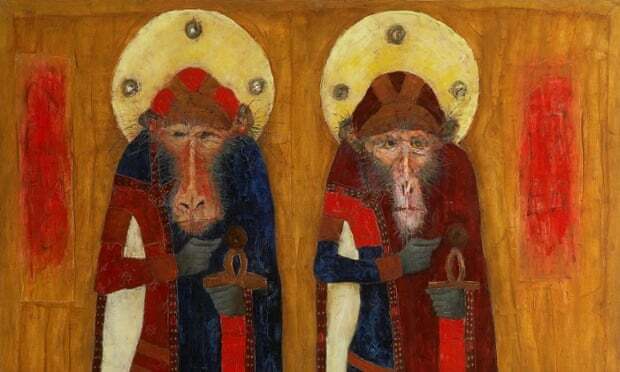 The “holy monkeys” have raised his profile in the art world. Most of his paintings now sell for upwards of $10,000 (£6,500) apiece. “The logic is hard to explain, but somehow the monkeys really scored,” says Dyomin, 41. But his casual merging of primates with Orthodox iconography is almost certain to ruffle feathers among the Russian Orthodox faithful. Something the artist insists is not his intention. Some people see the pictures as deliberately offensive; others an eclectic mix of old and new. The monkeys in Dyomin’s work fare better than his humans, often portrayed as blackened, skeletal figures sitting alone in kitchens, or being sick in the shower. In a particularly provocative painting , he portrays three women clad in black burqas, wearing suicide vests and riding bicycles under a banner reading “Think Green” in Arabic. The painting, he says, is as much about Greenpeace – “a totalitarian movement in its own right” – as it is about terrorism. Dyomin’s other paintings are sometimes affectionate, sometimes ominous depictions of Riga, his hometown. In one called Premonition Of War, white airships float in a cloudless sky. Dyomin’s response, he says, to Latvian concerns about a Russian invasion.